How good are you at remembering what people said? Not good? Then you'll do terrible at this game. But maybe you can use it to improve... or maybe you know someone who is even worse than you and you constantly want to rub it in their faces? In that case this game is PERFECT for you! What?!? 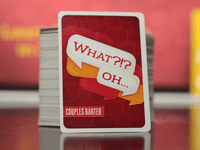 Oh... is a card game of couples banter I got from Kickstarter a while ago, and like many games I have it just doesn't get played. English language version, everything there.